We all know that Halloween means candy but you can include some fun activities too! 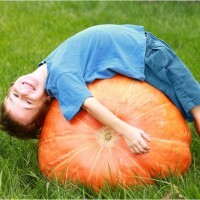 Here are some tips on how to make this Halloween a little bit healthier. Choose what works for you! 1.) Eat before you go – Be sure to have a healthy, filling meal before you set out to trick-or-treat. This will ensure that you and your kids aren’t starving and will cut down on how much you snack while you are trick-or-treating. 2.) Out of sight, out of mind – When the kids come home from trick-or-treating, let them select one or two of their favorite treats then put the rest out of sight. Allow one a night and that’s it. 3.) Try a scavenger hunt – Hide their favorite Halloween candy around the house; whatever pieces the kids find in a designated amount of time, they are allowed to keep. 4.) Be a Good Role Model – Kids want to do what their parents do, and that includes eating. Make sure you set a good example by not overindulging in the Halloween candy either. Learn more about the importance of parent role modeling. 5.) Freeze away – If you don’t want to waste the candy, put some in the freezer. You will have treats for the rest of the year! 6.) Relax! Let kids enjoy the candy and don’t stress about it. Just make sure they are eating a healthy dinner and getting plenty of exercise. Those few pieces of Halloween candy aren’t going to make a difference when you eat healthily and exercise regularly. 7.) Pay attention – Remember to inspect candy before your children eat it. Don’t let them eat opened candy packages or anything that looks suspicious or if you don’t know where it came from. Have fun with the Halloween activities and coloring sheets and check out our Super Crew Fun and Healthy Halloween guide!